Catawba College is setting the bar high for sustainability on college campuses in North Carolina. The president of Catawba College, Brien Lewis, is not only talking the talk about green efforts on campus he is providing resources to make it happen. The college has established a Green Revolving Fund to finance sustainable projects and with a recent gift of $100,000 they are taking action. Catawba College is working with Gallins Farm to compost all of the food waste from their dining hall. Gallins Farm collects the food waste from Catawba and takes it their facility to turn into compost. 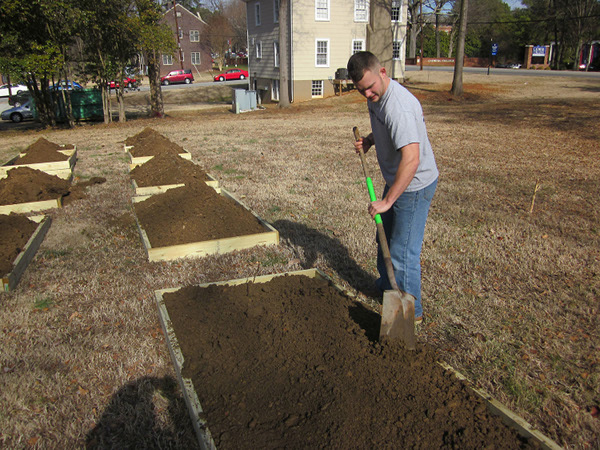 Gallins Farm has supplied the finished compost for Catawba to use in their student garden. "The composting project will help the college save money from the landfill costs and waste hauling fees. It will also help reduce greenhouse gas emissions, a goal of the American College and University Presidents Climate Commitment." In conjunction with the composting program students of Catawba College are also proposing other green initiatives such as making interior lighting on campus more efficient, installing mini-solar panels for exterior lighting, increasing their recycling efforts, and conserving water through more efficient shower heads. The progress Catawba College has made is noteworthy and with the support of their students and college president they are on their way to becoming a model for campuses throughout the region.